1. The sense of humor: this is one of those games that put a smile on your face all the time, when not a laughter. Sometimes it features simple bathroom jokes, sometimes a twisted humorous plot, sometimes a slapstick-based sense of humor… but its main goal is to show the player a good time. And you can bet we had a really good time playing it! If you usually read our “inspirational reviews” you might have noticed we really enjoy humorous games. So, you might wonder why the hell we are developing a dark, violent, oppressive point and click adventure such as “Dead Synchronicity“. Do you? Ok, we promise we’ll get our heads examined. 2. The approach: “Fester Mudd” pays homage to classic point and click adventures, specially the LucasArts ones. 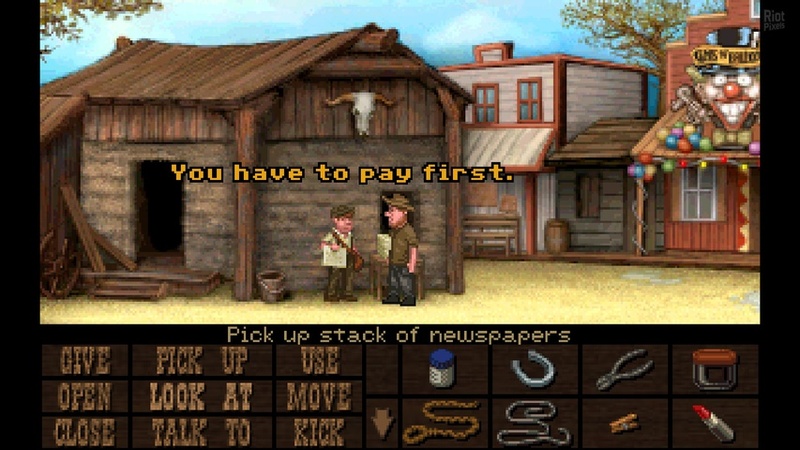 It does in several ways, and one of them is the approach: the player, since the very beginning, is free to explore a lot of different locations, interact with plenty of characters, pick and use a lot of items… and more locations, characters and items are available as they keep progressing. 3. The interface: to feature a SCUMM-like interface nowadays is a remarkable venture. Of course it’s a way to grab the attention of people over thirty, who enjoyed this interface playing classic point and click adventures. But, now that the trend is to simplify the games interfaces, it might be risky overdoing the HUD in pursuit of this “nostalgia” effect. Having said all that… we loved to go back to SCUMM!!!! Although the presence of some verbs is questionable as they are hardly used (this happened as well in classic SCUMM games) we felt SCUMM hadn’t lost its touch. And we enjoyed as well the fair amount of “pixel hunting”! At Prank Entertainment they have made a good job with this first episode of “Fester Mudd”. Paavo Härkönen and Josh Mandel have written a western full of jokes and references to the classic point and click adventures (it is impossible not to think of Mandal’s “Freddy Pharkas” as a reference), that every graphical adventure lover will enjoy. 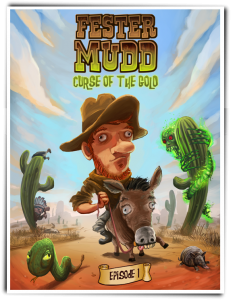 Although the game left us yearning for more (it feels a bit short) be sure we will anxiously wait for more Fester Mudd adventures!